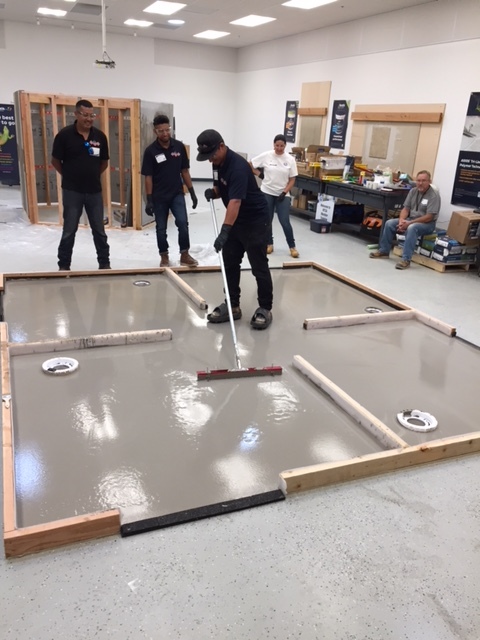 Bostik, Inc., a manufacturer of adhesives and installation systems for building construction, recently hosted an interactive “All Star” training event for National Tile Contractors Association (NTCA) Five Star Contractors at its Temecula Training Center in California. Bostik’s John Jarnagin , Senior Technical Service Representative joined forces with Mark Heinlein, NTCA’s Training Director for a full day of training (both in-classroom and hands-on) with 19 energized NTCA Five-Star Contractors in attendance. This regional training session, which focused upon Substrate Preparation and Large Format Tile, was sold out. Attendees learned the most updated methods regarding how to use the ANSI A108 standards and TCNA Handbook to address real world challenges focusing on substrate examination and preparation for setting large format tile. Bostik products used in the presentation included UltraFinish™ Pro Repair Patch and Skimcoat , Big Tile & Stone™ Large Format Tile Mortar and SL-175™ Premium Self Leveling Underlayment. The event concluded with a quick presentation by Jarnagin on Bostik’s key product lines, and a tour of Bostik’s state-of-the-art training facility.